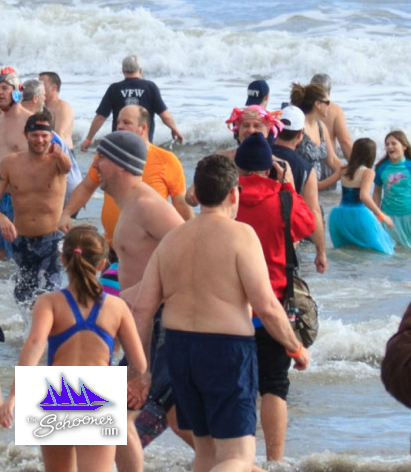 It’s that magic time of year when the most die hard of Virginia Beach ocean goers will brave the freezing cold February water for a good cause. Better than multiple cups of coffee, they will dash across the sand, abandoning common sense and that little voice of their mom telling them they will catch a cold. In fact, who cares. This is a bucket item you can mark off the list. And on top of that you get to visit the oceanfront. Here are a few questions, pointers, and observations about this event. Where do I go for times, dates, parking and more information? Run in, run out fast..
February does not really have a lot of outdoor water events. It is not July. In fact I think this is the only winter month with a water event. Thus it will be months until you can, or want, to do this again. Your efforts are not in vain. Your sub arctic plunge or Atlantic Avenue “wind” sprint are contributing to a great cause. The proceeds go to the Special Olympics Hampton Roads to give a whole generation of young Olympians a chance to compete. Just remember that when you hit the water. Are there any benefits of ice cold water? Opinions vary. Some say they feel “alive.” Others just feel cold. It is ice cold water. If you have any health condition. If you are prone to screaming. If you have a heart condition, low blood pressure, high blood pressure, bad knees, bad back, a cold, gluten allergies or anything else DO NOT GO IN THE WATER. It is really really cold. Iceberg cold. Freezer cold. But what about that feeling of “being alive” I get when I jump into it? It is great to have that feeling but it is your body going in to mild shock. Luckily, you can go in the water, scream, run, and support a great cause in the span of 5 seconds (give or take depending on how fast you run). One thing is assured. You will run out much faster than you ran in. Do people scream when they are in Atlantic? Why should I do the plunge? Well it does support a wonderful cause and you are much better doing it in Virginia Beach than anywhere further North. I mean there are people who do this in Minnesota. I guess they never watched Titanic. Should I bring a bathrobe instead of a towel to the Oceanfront? Bring warm clothing, bring blankets, warm food, and warm beverages. Moms, Athletes, Dads, Women pushing strollers..this is a great event to take place in the festivities without taking the plunge. Granted if you are pouring sweat after 4 miles a plunge in the ocean will cool you off real fast.